Yesterday I was delighted to discover that Nibras Kazimi has started blogging in English again. Kazimi has played the part of both activist and analyst over the last decade, working out of Washington DC or Iraq as the occasion required. 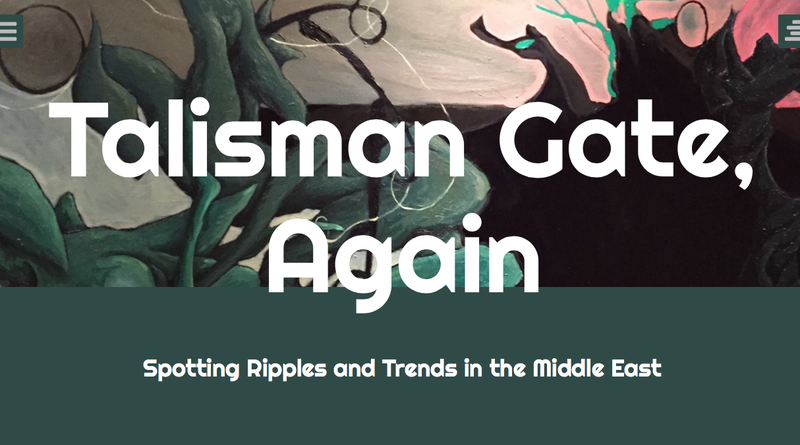 At the height of the old strategy blogosphere he was running one of the sharpest blogs on Iraqi politics around, Talisman Gate. Kazimi's internet musings began petering off in 2010 or so, and by 2011 he was writing mostly in Arabic. But it looks like he has set up a new English language blog, humorously titled Talisman Gate, Again. Over the last few days he has populated it with some excellent posts. ...Mr. Bolton’s own answer is to create a new state in the Middle East from the Sunni portions of both Syria and Iraq. I am sure that many will point out the problems with his formula. But he must be commended for at least trying to think through one. To place the center of gravity of the caliphate on a map, one needs to answer two questions: “How do the jihadists fight? What do they fight for in terms of military objectives?” And to understand jihadist military strategy one needs to understand the relative priority they give to the pursuit of war, rather than the pursuit of governance. If they were indeed deeply committed to governance, common sense would have it that the jihadists would seek to consolidate gains, buy time, and protect territory. However, they seem to prefer to give up territory rather than fight pitches battles, they invite international and regional powers to attack them, and they seem to place more emphasis on cowing the populations they control through intimidation rather than adopting a conciliatory manner. I maintain that the jihadists do not legitimize themselves through statecraft. They draw legitimacy from the battlefield. This is an argument they began to make in 2005 when Zarqawi broke with his mentor Abu Muhammad al-Maqdisi. This was also their argument when they declared the Islamic State of Iraq, the proto-caliphate, in October 2006. In their minds, the argument had been settled, and vindicated by their return from the dead when seizing Fallouja (January 2014) and later that year when ISIS took out the 17th Division and the Tabaqa Airbase in Raqqa. The jihadists periodically revisit the argument for recruiting purposes in order to counter the narratives coming from regime-allied Salafists in the region. The jihadists fight as if they were pirates, with the desert being their sea. Apart from the outlier battle of Kobani, the jihadists do not fight pitched battles. According to an Iraqi security source, only 97 corpses of jihadists were found when Iraqi forces retook Tikrit. More recently, the Kurdish Peshmerga counted under 300 jihadist corpses in newly-liberated Sinjar. 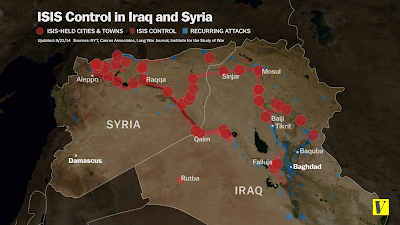 Jihadist swarmed in from the desert when they took Fallouja, Mosul, Ramadi and Palmyra. They mistrust urban and rural populations after the experience of the Tribal Awakenings. From 2009 until 2012, the jihadists had to adapt to the desert as their strategic depth. They had to adapt to hostile skies too. They were largely driven out of major urban centers in 2004, and beyond that, they were driven out of the date groves and orchards of Mesopotamia. I encourage you to read both posts in their entirety and add Talisman's Gate, Again, to your RSS reader. I have added it to the blog roll of the Stage on the right. Nibras Kazimi, "Sunni-stan vs. Fertile Crescent", Talisman's Gate, Again (24 November 2015). Nibras Kazimi, "What is the Strategic Depth of the Islamic State?" Talisman's Gate, Again (23 November 2015). This week has seen a flurry of commentary and discussion about ISIS and the proper way for France and the United States to respond to the attacks in Paris. I find myself repeating a similar set of points in many of these discussions, and thought it would be useful to put them all in one place. 1. Last month we witnessed the deadliest bombing in Turkey's modern history. A week later, a Russian airliner fell out of the sky into the sands of the Sinai, destroyed by a bomb smuggled into its cargo space. A few weeks later two suicide bombers blew themselves up in a Shi'a neighborhood in Beirut. It was the most destructive terrorist attack the country has seen since the Lebanese civil war ended two decades ago. As with the urban siege in Paris, ISIS (or one of its affiliates) has been implicated in all of these attacks. Over the last two years, ISIS or its affiliates have also claimed responsibility for attacks in Iraq, Syria, Egypt, Libya, Niger, Afghanistan, Tunisia, Belgium, the Philippines, Saudi Arabia, Cameroon, Yemen, Nigeria, and the United States. If we expand this to include all attacks inspired by Salafi-Jihadist ideology over the last five years the list of victims includes six NATO member states and all five permanent members of the U.N. security council. Thank you, Mr. President. One hundred and twenty-nine people were killed in Paris on Friday night. ISIL claimed responsibility for the massacre, sending the message that they could now target civilians all over the world. The equation has clearly changed. Isn't it time for your strategy to change? President Hollande plans to meet with both Barack Obama and Vladimir Putin in the coming days to hammer out a joint strategy, so this may change. But at the time of this writing the greatest strategic repercussion of the Paris attacks have been the end of Russia's pariah status in the halls of the West, with the minimization of America's role in the region coming in at close second. The latter of these developments may prove temporary; the former is probably permanent. 2. There has been some misunderstanding of ISIS and the exact threat it poses—both to the West and to the wider course of human civilization. Its physical capacity to plan and execute terrorist attacks in the West is far less important than its vanguard role in Salafi-Jihadist thought generally. An analogy with the revolutions of Mao and Che is an apt one; their success inspired a wave of communist insurgencies that left destruction and misery across the globe. ISIS is doing now what the first Communist revolutionaries did decades ago. ISIS's mere existence is living proof that Salafi-Jihadist ideology is legitimate. Its exploits show that those who live and die for the Salafi-Jihadist cause can accomplish great and terrible deeds even when the powers of all the world are arrayed against them. If it is not discredited in the minds of its believers we will see ISIS affiliate insurgencies and lone-wolf attacks for decades to come. As long as ISIS exists as a caliphate in control of physical territory these men and women will believe that history—and God—is on their side. Proving this notion to be the nonsense that it is is the most important thing military force could accomplish. 3. In a related point, the "ideas cannot be bombed" meme must be done away with. I recognize that we are engaged in an ideological contest. Like those who propagate this meme, I also recognize that the bombings, shootings, and stabbings that rock our world are not evidence of some new clash of civilizations—rather, they are the spill-over of a clash within a civilization. Salafi-Jihadists (and their occasional Deobandi-Jihadist counterparts) are doing all in their power to hijack Islamic civilization for their own ends. In some places they are succeeding. But the "ideas cannot be bombed" set seems to miss just how they are doing this. All of ISIS's propaganda and internet savvy would mean nothing absent the strength of their arms and the length of their conquests. Salafi-Jihadism is an ideology spread by the sword. An honest review of human history suggests that this is the rule, not the exception. Political ideologies disappear when they are discredited. You must search long and hard to find important political ideals that were discredited by rational argument or rhetorical slight alone. In truth, most ideas die when they fail to provide the boons they promise. Nothing can break an ideological system apart faster than the crushing weight of reality. The Taiping Heavenly Kingdom inspired millions with its millennial ideology. It was discredited when its capital was sacked by imperial forces and its leaders publicly killed. At the turn of the twentieth century China, Japan, and Korea saw vast changes in the shape of their society as the old Neo-Confucian world view that had upheld the old order was discredited by Western power. In Europe both communism and fascism rose to horrific heights because the classical liberalism was discredited by the horrors of the Great War and the heartache of the Great Depression that followed it. The fascist model did not survive the desolation of the premier fascist powers during the Second World War. The mission civilisatrice of the great colonial empires died as Britain and France lost control of their colonial domains. As a global revolutionary force communism withered away because the events that closed the 20th century left it discredited. If Americans do not worry about communist revolutionaries anymore it is because communism was so thoroughly discredited that there is no one left in the world who is willing to pick up arms in its name. History suggests two models for the destruction of toxic ideologies: defeat and implosion. Communism, protected as it was by a thousand nuclear warheads pointed at American soil, died through implosion. It was a slow death. The ideology ruled for just under a century. In that time it killed tens of millions of people. Pity those who must endure an evil ideology too strong to be defeated. Defeat is the other way to kill a way of thought. It is the fastest way ideologies die, and in the long course of history, most common. This should be clear from the sketch above, but if we stretched our analysis back through time we find the same lesson repeated again and again over the centuries. One idea after another has been destroyed by steel, by bullet, and then by bomb. The Middle East never had the cataclysmic encounter with modernity that convinced its elites to abandon old ideologies, as Northeast Asia, India, and Africa did. Salafi-Jihadism will not disappear unless it is just as forcefully discredited. 4. If your ideal strategy to defeat ISIS (or Salafi-Jihadism generally) involves Westerners, and especially Americans, engaging in a nuanced and culturally aware contest of narratives seamlessly coordinated across all branches of government, then your ideal strategy will fail. [This is] one of the central problems of policy punditry in 21st century America. It doesn't pass the StupidProof (TM) test. In the context of this discussion, this means that American leaders and officials should stop declaring takfir. They do not and never will have the cultural knowledge or sectarian authority to engage in eschatological or doctrinal discussions with the Islamic world. None of them are ulama, and they look foolish when they try to play kingmaker among the uluma. A corollary to this is that if your preferred strategy to defeat ISIS requires right-wing elements in Europe or the United States to not say (or do) nationalistic, populist, anti-Islamic things, then your preferred strategy will fail. These people are a part of us. They will be with us in the foreseeable future. Their voices will likely grow stronger in the coming days. This is simply a reality of the current policy environment that must be embraced or worked around. 5. ISIS is unique in that is has given up the advantages of the insurgent in favor of statehood. ISIS has a physical capital. It has a mechanized ground arm. It has an ideology that forces it to defend physical territory. If Western troops were to march on Dabiq tomorrow, they would be met by ISIS troops, or its claims would be fatally discredited. If NATO wanted to wage a set piece land campaign against ISIS, they could, and they would win. The most difficult aspect of such a campaign would be accepting Russian and Iranian help, knowing full well that any post ISIS world will substantially strengthen the position of both. 6. The struggle is what to do when the campaign is over. America and the West came out looking strong after the unparalleled success of the 2003 invasion. This image was tarnished during the insurgency that followed. Time and time again we have shown we are no good at recasting Near Eastern societies in our image. The common argument that elections and power sharing agreements will be the key to a successful peace process is hard to take seriously in 2015, for we have seen democracy in both Iraq and Libya fall to pieces. The best possible solution I can imagine is political decentralization, letting the Alawites have their piece of Syria, the Kurds theirs (but which of the three fractious Kurdish groups will rule? ), and so on. But this will not satisfy the Sunni tribes of Jazira. The most likely scenario is another Iraq style insurgency erupting upon whoever’s armed forces are left to uphold the peace. The bad news I have to share with you is that the last time any Western effort to strategically defeat an uprising in the Middle East, meaning crushing it and bringing some sort of lasting peace, was in the early 1930’s, over eighty years ago. The worse news is it was Fascist Italy pacifying its Libyan colony with horrifying force. Italy had occupied Libya since 1911-12, when it grabbed it from the ailing Ottoman Empire, and Rome periodically crushed small-scale rebellions there. By the late 1920’s, however, the Italians faced a serious uprising, led by the wily Sheikh Omar Mukhtar, a gifted rebel leader. To crush this revolt, Mussolini dispatched General Rodolfo Graziani with a mandate to exert Fascist control over Libya using all means necessary. This Graziani did, employing armor, artillery, and airplanes, some carrying chemical bombs, to kill everybody moving in rebel-held areas. Moreover, the Italians interned the entire civilian population in many places, some 100,000 people, mainly women and children, of whom forty percent died from disease and malnutrition. Mukhtar was captured by the Italians in 1931, his rebel army having been ground to pieces, and was executed in public. By the next year, Rome had pacified Libya, thanks to outreach to the defeated rebels, and the country was at peace, as it would remain until the Second World War. That many Libyans fought for Fascist Italy against the British in that war says something about Italian acumen in suppressing rebellions — although, needless to add, Graziani is considered a war criminal today, as he certainly was by our current standards. 7. One possible solution is to organize a punitive expedition. Such an operation would be designed to avenge, destroy, dismantle, and leave desolate. We would go in, break things, and then leave when we were done. This is an old way of warfare. Its success is checkered. It is most viable when the avenging power has the means to return every so often and repeat the process. There is no guarantee an ISIS 2.0 wouldn't form in the wreckage left behind when coalition forces withdraw (though surely in this case the Kurds and Alawites would be in a stronger position to defend against them), so that option would have to be left on the table if a punitive model were to work. The other challenge with the punitive model is that it rubs deeply against the grain of modern thought. B.H. Lidell Hart's claim that "the object in war is a better state of peace"  has become a bedrock assumption of Western military theory, but it may not be true in this case. In this region there might not be a better state of peace at the end of tunnel, just a less explosive phase of anarchy. We have the power to destroy ISIS and permanently discredit the idea of new armed caliphate arising from the sands of Jazira. We don't have the power—in the short term, at least—to bring peace and prosperity to the region. But is this really the end goal we should be aiming for? If the public can stomach making a mess of a country and leaving others to clean up the mess, that may be enough. This is essentially what we are doing with airstrikes now, though ineffectually. But somehow once boots hit the ground the expectations are always greater, and the bar of success for land based operations is always higher. This might not bother some countries. France, Russia, and the other victims of ISIS attacks can plausibly claim that they bear no special responsibility for a post-ISIS Near East and thus have no interests there beyond vengeance and destruction. This is harder for the United States to claim, which was instrumental in creating the conditions where groups like ISIS could flourish in the first place. White House Office of the Press Secretary, "Press Conference by President Obama -- Antalya, Turkey", whitehouse.gov (16 November 2015). T. Greer, "Wanted: A Stupid Proof Strategy For America," Scholar's Stage (30 October 2015). John Schindler, "Why ISIS is Winning," 20 Committee (14 November 2014). B.H. Lidell Hart, Strategy, 2nd. ed (New York: Meridian, 1991; or. ed. 1941), p. 336. I wish I could say that this Vox hot-take by Max Fisher is the most foolish piece Vox has published and Fisher has written. Alas, this is not the case. It is a rather run-of-the-mill effort from Vox's foreign policy team, no more vapid than their usual fare. What distinguishes this piece from it peers is that is has prompted the best critique of Vox style journalism that I have had the pleasure to read since Vox's creation. ...If you are not particularly religious, and furthermore do not know much at all about religion — except the assumptions you bring to the topic from your inadequate formal and experiential educations — then you will write, without embarrassment, things like, "religions are big and diverse, and people get out of them what they bring into them." Let me amend that, and not in favor of the writer: it is not even necessary to know about religion as such to know this is false — it is simply necessary to know about literature, and not to any real depth. This is the sort of thing that reasonably educated people ought not to say and still less believe, as it is so evidently wrong — but it is also the sort of thing that wide swaths of our media establishment, of course chief among them the powerholder-stenographers at Vox, credulously declare. Ideas have consequences and power, ideologies have meaning and content, and faith transforms lives, until those enduring truths collide with the pieties of Acela Corridor explainer-set types — at which moment all narrative, concept, and schema becomes an edifice devoid of purpose except what its occupier, himself a changeless being, brings to it. In the Book of Vox, Saul is stricken with a vision of Christ on the road to Damascus, and He says, "Be who you always were, guy," and Saul replies, "In that case I identify as a Paul." The Vox writer's intent here is of course to defend Islam, by advancing an argument that Islam possesses no intrinsic power to change lives — for better or worse. It's all self-actualization, as if the world's second-largest faith were a benign Californian therapy group with a run of bad luck on the clientele. Of course there are plenty of Muslims who will tell something rather different: by our lights, good men who became bad by their understanding of the faith, but also bad men who became good by the same process. The sagacious seer of men's souls Max Fisher argues that faith is incidental to both transformations. The men and women involved will declare it was essential to them. Here we see again the stunted intellectual universe of the elite drawing one of its leading lights, such as he is, into a defense of Islam that is in fact an infantilization of Muslims. They deserve better, but he is not equipped to know it, nor give it. The truth is that most faiths, though of course not all, possess a concept something like what the Christian Church Fathers called metanoia — usually translated as "repentance" but more properly the transformation of the soul. It is visible in the tales of Paul, Raskolnikov, and Malcolm X. It is not "people get[ting] out of [religions] what they bring into them." Quite the opposite: it is people getting out of religion what they never had before. Max Fisher of Vox does not misunderstand this because he lacks a grasp of faith: he misunderstands this because he does not grasp the nature of man. He possesses a graduate degree in international security issues from the Johns Hopkins University, writes for a major publication, is a go-to for White House narrative promulgation, and he lacks this most basic element of the liberal education. "Photo of the Hawelka Cafe on a Quiet Thursday Morning,"
Photograph taken by "KF" (Vienna, 2 Feb 2006). There have been many responses to last week's post, "Requiem For The Strategy Sphere." Ryan Evans, Brett Friedman, Adam Elkus, Kelsey Atherton, Andrew Exum, and Mark Safranski all participated in long tweet streams discussing the piece. I have collected all of these conversations under one Storify stream for those that might have missed them. You can read it here. I would like to elaborate on one idea brought up in Mark Safranski's response stream. From their beginning blogs have had two basic models to follow: opposite-the-editorial pages of late 20th century newspapers and the Viennesse coffee houses of the old Austrian-Hungarian Empire. Many posts here at the Stage follow the op-ed model. This style of writing is formal. It designed to present a tightly argued opinion or perspective, and this position is presented as a done deal, not a work in progress. This is a broadcast style. The flow of information is intended to go one way: from writer to reader. Readers may find some way to reply to pieces they particularly enjoyed or despised--publishing a polished rebuttal is probably the fastest way to do this--but interaction is not the main purpose. This model is at least as old as the 17th century pamphleteers, and is perhaps older than that. What the internet did to this ancient art was remove the gatekeepers that separated writers from readers. Now, at least in theory, anyone can write an op-ed that will be read across the world. The coffee house style is informal. It is sometimes quick and "off the cuff" but it does not need to be. More important is the intent of the writer and his or her relationship with the readers. Coffee house bloggers brainstorm on the page. They play around with ideas. They are unafraid to say "I have been thinking about a bunch of things, and today I am just going to throw them all out there. You all need to tell me if any of these ideas work." This style succeeds only if there is constant interaction between the writer and the readers. Information flows both ways. At its best this style of writing prompts the same kind of insights and breakthroughs that face-to-face discussion does. The difference is that internet "face-to-face" discussions can be had with just about anyone from just about anywhere. In olden times you could only participate in the Vienna coffee house culture if you lived in Vienna. The internet has freed this model from geography. These are types on a spectrum. Paul Krugman's or Ross Douthat's blogs for the New York Times lie very close to the pure op-ed ideal; web forums are of the coffee house mold. Both are useful. Most publishing platforms and blogs lie somewhere between the two extremes. The current Strategy Sphere is better at publishing op-eds than building coffee houses. War on the Rocks is probably the center hub of current NatSec writing, and it is an excellent example of what an op-ed style publication can be. Analysts and defense minded intellectuals who would have had to compete to get their work published in The Atlantic or The New York Times now have a place to write where they know their views will be read and assessed by thousands of others in the NatSec community. There was no space like this before War on the Rocks was created in early 2013 (though several other publications have begun to compete with it since then), and the Strategy Sphere is better for it. 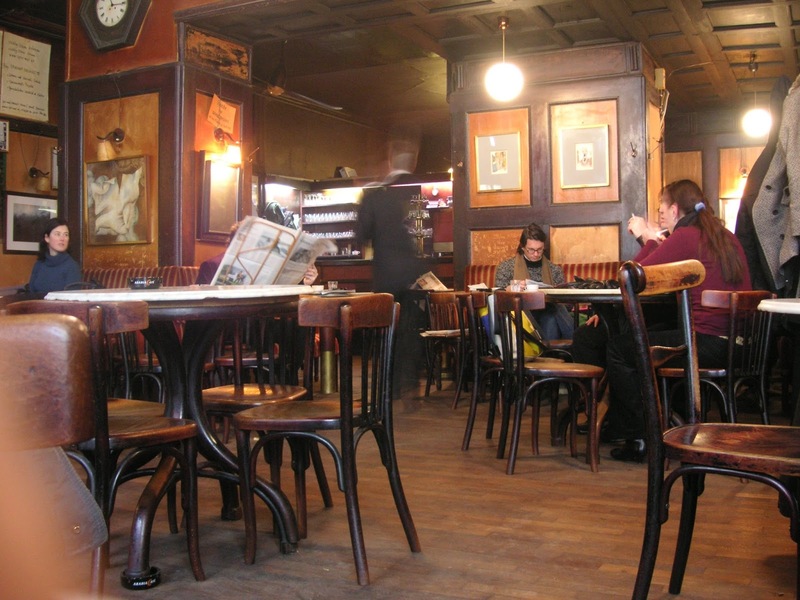 Harder to find in the current landscape are the coffee houses. As I described in the "Requiem" post, these were once central to the online strategy community. In that post I wrote why I thought the old ones fell apart, but said little about whether or not new ones could be created. I don't think social media has doomed this style of writing to obsolescence. There are several blogging communities--the policy economics bloggers, the 'rationalist' community, and fandoms of many TV shows and fictional series, for example--that have only grown as the web around them changed. It is quite possible to have a vibrant blogging community in 2015. The deeper question is whether or not this is desirable. The answer to that depends on how useful you think public brainstorming and free wheeling discussion really is. I have heard many people say that these environments are key to creating breakthroughs in theory and practice. I have not seen much empirical evidence to support this claim, but it seems intuitively true. If it is true then the current online space for discussing matters of war, diplomacy, and strategic thought is missing something critical for its future health. Why Did Asian America Abandon the GOP? Republicans should be alarmed by this statistic, as Asians weren’t always so far out of reach for Republicans. When we examine presidential exit polls, we see that 74 percent of the Asian-American vote went to the Republican presidential candidate just two decades ago. The Democratic presidential vote share among Asian Americans has steadily increased from 36 percent in 1992, to 64 percent in the 2008 election to 73 percent in 2012. Asian Americans were also one of the rare groups that were more favorable to President Obama in the latter election. The author, Cecilia Hyunjung Mo, goes on to suggest that Asian America's flight from the GOP is best understood by Asian Americans' "feeling of social exclusion stemming from their ethnic background." This explanation is unconvincing. The main evidence she uses for her contention is a study that relies on social priming for its main evidence. This is a point against it already--social psychology has been embroiled in a crisis of its own making for the last four or so years as researchers have shot down one priming study after another. The criticism of these studies are legion: they fail to replicate, there is no proven connection between impressions primed in the moment and long term actions (in this case, voting), and it is too easy for researchers to read their own narratives into the data or into their subjects' performance. The controversy is an old one, and it isn't hard to find readable exposes on the whole affair. Here is one at the Chronicle of Higher Education, here is one at Nature, here is one from the New York Times, here is one at Psychology Today, here are three from Discover Magazine, here is one from LessWrong, here is one from Slate Star Codex, and here is a famous e-mail by Nobel Laureate Daniel Kahneman telling the entire sub-field to get its act together. In view of all this, a study based on social priming should not be accepted uncritically. At a minimum I don't regard one as proper evidence unless it has been replicated by an entirely separate research team. (In this case, I would also like to see stronger evidence linking short term implicit behaviors with long term political affiliation). A second problem is that Mo's research does not answer the question she posed at the essay's start. The interesting question is not "why do Asian Americans not vote Republican" but "why did Asian Americans stop voting Republican?" If the real issue is that "Asian Americans are regularly made to feel like foreigners in their own country," as Mo suggests, then she must explain how Republicans made Asian American feel more like more foreigners in 2012 than in 1992. Is it plausible that the Republican party has become less accepting and more prejudiced towards Asian Americans over the last three decades? Perhaps, as Reihan Salaam has suggested will happen, Republicans have finally learned to play identity politics as well as the Democrats do. This is a remarkable development, if true--a fundamental change in the way the Republican party is structured. When did this change happen? Was it with Trump? The Tea parties? The rise of social media and hash-tag social justice campaigns? The election of Barrack Obama? Most descriptions of the GOP as the party of white nationalism explicitly call this an Obama-era development. But if this is true, how do we make sense of Asian American votes against the Republicans in 2004, back when the main issues on the table were war, terrorism, and taxes, not race or immigration? The GOP began to "lose" Asian American voters in the 1990s. These losses continued at the same pace during the Bush years. They did not accelerate under Obama. Given the consistency of this steady decline, any potential explanation of why the GOP "lost" Asian America needs to explain what happened in all three eras--not just the politics of the present moment. Here is a simple observation that fits the bill: The Asian Americans of 2015 are not the same people as the Asian Americans of 1990. The most important factor in Asian America's changing political attitudes is immigration. U.S. Census Bureau, "The Asian Population: 2010," 2010 Census Briefs (March 2012), p. 4. In 1990 approximately seven million Americans were classified by the Census as "Asian American." In 2010 that number had risen to seventeen million. This means that the majority of potential Asian American voters in 2015 were not citizens when Bill Clinton was first elected. There are several implications of this fact. One of the few tenets that unites Republicans from all corners of their fractious "big tent" is that government should be small and non activist. In their 2012 study Rise of Asian America Pew asked Asian Americans what they thought of this notion. 55% said that the government should be larger and offer more services. Only 36% said it should be smaller. But when the survey split up Asian Americans between"native born" and "foreign born" individuals, they found an enormous difference. 44% of Asian Americans who grew up in America thought the government should be smaller, while 48% (a 4 point spread) thought the reverse. In contrast 33% of foreign born Asians thought the government should shrink, while a whopping 57% said the government should provide more services (a 24 point spread)! 1st generation immigrants from Asia do not look kindly on attempts to cut down government, and 1st generation immigrants is what the majority of Asian Americans are. More important than the number of these immigrants, however, if their composition. The census labels a wide group of people as "Asian Americans" and most pundits take this category at face value. This is wrong, if for no other reason than the fact that few "Asian Americans" use it themselves. Most immigrants from Asia, especially in the 1st generation, identify themselves with their country of origin: Indian-American, Chinese-American, Cambodian-American, and so forth. Describing all of these different groups as "Asian America" hides the economic and cultural fault lines that divide them. Politics is a good example of this. There is a clear leftward shift among all groups from 2004 to 2012. However, disparities between the groups are large and politically significant. Indian-Americans are overwhelmingly Democrats. The majority of Vietnamese-Americans are Republican. If all "Asian Americans" were Vietnamese then "Asian America" would be a Republican stronghold. But the majority of Asian Americans are not Vietnamese. In fact, the percentage of Vietnamese-Americans as a proportion of all Asian Americans has barely changed since the Clinton years. In 1990 approximately 8% of Asian Americans claimed Vietnamese ancestry. Today the number is 10%. In contrast, Indian-Americans were only 12% of the total in 1990, but are 19% of Asian America today. The political implications of this should be obvious. This data points to another problem with Mo's main contention. If micro-agressions and discrimination are driving Asians away from the GOP, why has the flight been so uneven from one demographic group to another? Indian-Americans, who are often associated with Arab terrorists in the white hick mind, can plausibly claim they face greater prejudice than others placed in the "Asian American" camp. But what about the others? Are we really to believe that Japanese-Americans face more prejudice than Vietnamese-Americans--even though Vietnamese-Americans are poorer and speak far less proficient English on average? Were I to ask you to identify the likely political affiliation of a couple who both have post-graduate degrees, rarely attend Church, and lives in an upper scale neighborhood in California or New England, what would you guess? Surely there are some Asian Americans who were once Republicans and now are Democrats. But shifting political loyalties are not the entire story--indeed, it cannot be the entire story, for the majority of Asian Americans were not citizens when their demographic category voted for the GOP en masse. The real story is not the loss of old GOP voters, but the GOP's utter failure to attract these new immigrants to their cause. A thorough explanation shouldn't begin with micro-triggers, but with more fundamental changes in Asian America's demographics: the rising proportion of Asian Americans with college and post graduate degrees, the growing numbers of Indian and Chinese-Americans, and so forth. 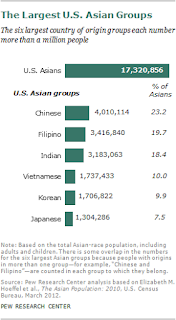 Pew Research Center, Rise of the Asian Americans, (2012; last updated April 2013). U.S. Census Bureau, "The Asian Population: 2010," 2010 Census Briefs (2012). Cecilia Hyungjung Mo, "Why Asian Americans Don't Vote Republican," Washington Post (2 November 2015). Pew Research Center, Rise of the Asian Americans, (Pew Research: Washington DC, last updated 4 April 2013), 159. Asian American Legal Defense and Education Fund, "The Asian American Vote: 2004," (New York: AALDEF, 2004), 8; Jim Lobe, "Asian Americans Lean Towards Kerry," Asian Times Online (16 September 2004). Pew, Rise of the Asian Americans, p. 164. The Asian American Legal Defense and Education Fund, "The Asian American Vote: 2012," (New York: AALDEF, 2012), 9. 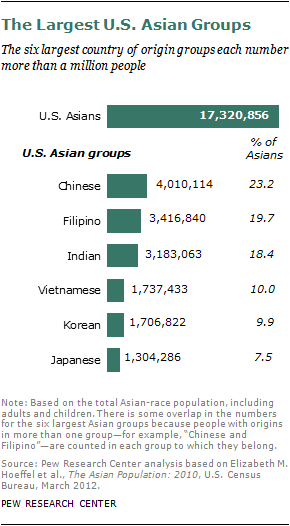 All of these numbers come from Pew, Rise of the Asian Americans.